Visit Imagen (SLurl) for this unique dollarbie mannequin skin. I learned about it from Vint Falken's blog (Web). Momo's blog (Web) gives more information if you read German. The Polly Jean region has some really radical store builds but poking inside some shows that the merchandise gets radical, too. The owner of Blonde clearly has a dream that the mid- to late-1950s America comes back. 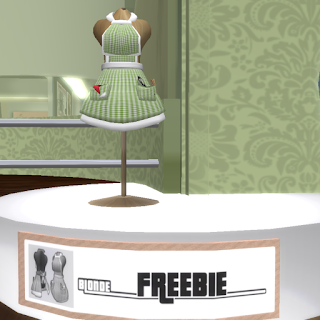 This free all-prim apron (SLurl) is an example. You'll also find some really retro furniture and beauty salon hair dryers, among other things. Not surprising when you consider the store's exterior resembles a radio of that era, despite a 1980s cassette tape outside. As the Holidays wind down you may find that you didn't get world peace, an end to hunger, or your Prince (or Princess) Charming let alone the virtual goods you wanted. Looks like you have to go shopping. Go armed with these tips and you should be able to make out pretty well. First, look through your gift certificates. Make sure you know exactly how they need to be redeemed and when. I've seen some that expire and others that are good for only select lines of merchandise. And keep in mind that you will need to pay the difference if the item you want costs more than the value of the certificate. Or you might not get a refund if the item cost less. Is the item you want from an affiliate vendor at a shop and not the shop owner? You might not be able use the certificate. If you don't see anything you want at the store, contact the owner about turning in the certificate for cash. Some merchants allow this, perhaps less a restocking fee. If you can't exchange for cash and the certificate is transferable, think about selling it to a friend. Think about holding on to the gift certificate if you don't find anything you like. If there is no expiration date you need only worry about the store closing before you use it. The best tip is to look for bargains like this Phat Pack at Solange (SLurl). Each outfit is L$300 but the set is L$600, That's a L$100 savings per outfit. Often items in sets like this can be mixed-matched so the number of outfits would increase. A better bargain would be if the outfits were transferable. Lessons here? Combos save money and watch the permissions. Another tip is to look at the branch locations of a store. Sometimes they run sales that are not available in other locations. This could celebrate an opening or be part of a mall promotion. Sometimes you'll find different products at other locations, too, perhaps due to the maturity level of the land. Lastly, think about your purchases for a day or two if you can. What looks good one day might not look good the next. You are coming off a high after all the freebies and hunts and sales. Don't let being wound up deplete your wallet. What a friggin' adorable store this is! Rouge Darcy sells rather unique backpacks (look at the bomb on my back in the pic), cute girly-wear, and neo-goth clothes, among other items. There are freebies (SLurl) under the stairs and a Lucky Chair on the other side of the stairs (10 minute cycle; current prize is a special Christmas outfit). Happy Hannukah! & Katat0nik and PixieKnickers Freebies! Oh what a wonderful morning!! I hope you are all enjoying your holiday(s)!! As I've been vigilantly lighting the candles of the menorah each night I wonder to myself when am I going to find a Hannukah dress for the occassion? And so I was so pleased to get a the news this morning that Katat0nik Pidgeon had added a hanukkah dress to the gifties under the tree at Axis Mundi!!! In addtion to this dress there are many freebs, cheaps and dollarbies clothes and goodies! Katat0nik does wonderful work and is so generous year round, if you haven't tried on one of her dresses then you must. MUST. As I like to do on quiet mornings I was sorting through notices that Serenity works so hard to put out. I popped over to pick up a few gowns at Port Babbage and took a few minutes to look around. I'M SO HAPPY I DID!! LOOKIT THESE SHOES!!! CUTE!! This pair is from Nix Sands & RubyRed Xue of PixieKnickers & XCENTRICITY! and they are set out for 0L and they are soooo perfect for the season. These shoe are absolutely wonderful! 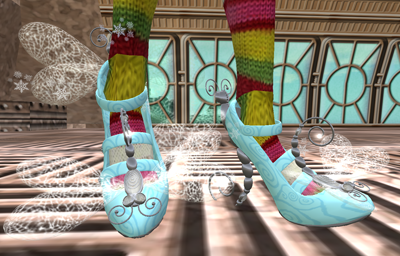 Excellent prim work, very pretty textures, and the shoes emit pretty little particles, just gorgeous! I saw these and I thought, I need particle emitting fairy style high heel shoes. NEED. The shoes are also available for sale and come with texture/color change options so it's like having over 100 shoes for 1 price. niiice. 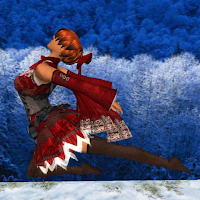 And this just in, as I write this post, the Rouge Pose sets are 50% off today only for the holiday. In addition, CodeBastard Redgrave has a lucky chair out and at least one free couples pose set. It's all at her shop at the Rouge Sim. Dress: *katat0nik* Freebie Hanukkah Dress - 0L - under the tree at Axis Mundi. Bloody Knees: ::::QC Designs:::: Bloody knees with bandaids for 0L just because i loves you all! 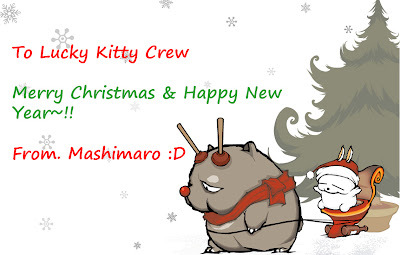 Also I would like to wish everyone in the crew happy holidays (whatever you celebrate). ^^ So I'll keep posting and hope to keep having the great support you all have provided us through the years. Thank you, Atomic Kitty, for this great present (SLurl for "current" location. You may need to use Search.). Lucky Kitties Uccello and Angela sincerely hope that all of you have really great Holiday. Make it fun, safe, and full of love. Today was Whim Day. Something persuaded me to go to Atomic Kitty when I heard they had a temporary location (SLurl). Like several other shops they are giving out a gift-a-day with boxes under a tree and it's pretty good stuff. The penguin backpack in the pic is one item and I'm tickled that it works so well on Loco Pocos avies, too. The box you see has a sit anim. Nekos will love the tangled-in-the-lights look. Other prizes include clothes, a great waiting-for-Santa cushion (with milk 'n cookies! ), and more. The puppy is an adorable follower pet that I got from a Lucky Chair at Cartoon Kids (SLurl) when I had a notion to jump on a chair call. He rolls around a lot when you move but he greets those that come near you and says cute things when you pet him. Toys, food, and a bed make adopting one easy, if you can fight the crowd at the chair. Pretty good whims I had today. 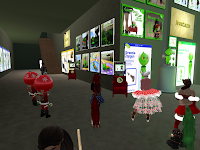 Greenies (SLurl) is always a blast, but this Christmas they have been extra generous (see previous post) and they continue to give. Go now to grab the presents under the tree! These include clothes, avies, toys, and more! Be sure to look up, too, for ornaments made by visitors, like this one from me! And hit up the kitchen freezer for some ice cream. Read more about all this on Vint Falken's blog (Web) or just go! Long Awkward Pose (LAP) has a free Animation Override (AO) for any avatar under 30 days old in Second Life® right as you enter the store (SLurl). Also near the door is a pile of boxes with some really great freebie poses. I used several of these on a modeling job today much to the delight of the photographer (admittedly, my being half nekkid kinda swayed his opinions of everything). Free skins and clothes are available in the Welcome Area. The catch is that the Welcome Area is on the Openlife grid. Read more about it on my blog (Web) or visit the Openlife site (Web). 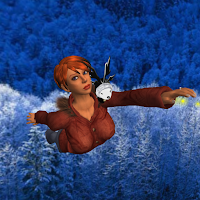 If you are at all familiar with Second Life then you can handle Openlife. FYI - Look for freebies in the Sandbox. Lucky Kitty Crew Exclusive Report - Bare Rose (SLurl) has a fun Holiday Hunt in the works and I was lucky enough to know someone who snuck me in for a preview. It starts with a note card that essentially tells you where the first prize is, but not exactly where. You have to do some hunting based on clues in the note card. Each prize is part of an outfit so you have to gather them all for a complete set. When you arrive at each location you should click the Info sign, choosing a language for the note card. Read carefully, this is your first clue. Bare Rose Black Santa (boy) - You will get parts of a boy's outfit and a girl's outfit in each prize so you'll eventually want to set up folders for each. These Black Santa outfits are first. A gift sack with pose animation and hat are part of the first outfit. Bare Rose Black Santa (girl) - You will also get more note cards (in many languages) with a landmark and a clue to the next prize. I'm not big on femme outfits, but this one is great. I plan on wearing it often. Bare Rose Flurry Red (boy) - This is the next outfit and like the Black Santa, the boy's and girl's parts are mixed together. This reminds me of last year's outfit or one very similar that I got last year from B@R. Very punk in my eyes but I'm not one to know fashion. I just know I like this one. Bare Rose Flurry Red (girl) - And this one, too, the girl's version. June Dion (the Bare Rose owner and designer, if you didn't know) is quite creative and has a unique style. The quality is great, too, with well-aligned textures and prims that need very little adjustment. Bare Rose Hooded Red Coat - Don't tell anyone, but there is a bonus prize if you track down a thieving reindeer. This coat just plain rocks. The pet you see on my shoulder is included. Very cute. Serenity will be sending an announcement when the hunt is open to the public, but Bare Rose members get to sneak in early. Show up at B@R's main store wearing an outfit from the shop and ask any store rep for a group invite. Not only will you be able to start the hunt early but you'll have access to an exclusive sandbox and cafe (built by our Serenity) for VIPs ... extra prizes there! Extrovirtual has "sort of" moved (SLurl). The previous Openspace sim has been upgraded to a full sim and building it going on even as I write this. Noramyr Gullwing, owner of Flights of Fancy and dragon-breeder extraordinaire (and Deleter of Floors, it seems) said that a grand opening will be announced to the group soon. Drop in and check it out ... a really nice build. 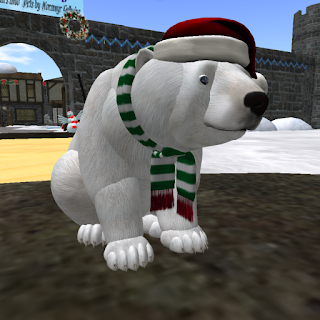 I showed up just in time to see a very festive Wynx Whiplash in a polar bear avie. I didn't see it in the store but I hope she releases it soon. Folks love my Wynx panda and black bear avies. Her Lucky Chair is up and running with the Mad Cat Snow Cat as the current prize. 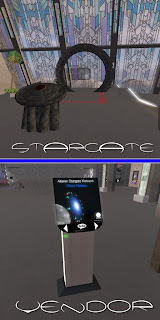 Stargates: You've seen them on television, if only in adverts, and you've seen them around Second Life®. But I found a place where you can get several styles of them free: The Subnova Citadel (SLurl). Pay the vendor (pictured) $L1 and your payment will be refunded while a package is prepared for delivery. I met a Gate Traveller at Shiny Girl (SLurl) and he showed me how the gates work. Watching it was really cool. It appeared to work just like the one on the TV show, but when you click the center of the SL one (after activation) it opens the Map so you can teleport to the new place. It would be helpful to know where you are going and to do that you'd have to get more in depth with the Stargate culture in-world, but just remember this to have some fun: type /d random in chat and the gate will activate and choose another gate at random. 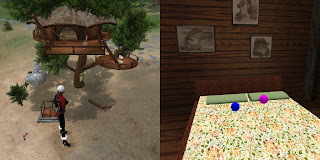 Tree house designs by Tobias Novi (SLurl) builds some very high-quality and unique dwellings, but not just for people in Second Life®. As you can see in this picture, the store takes good care of some of our four-legged friends, too. Novi realizes it is not just a matter size, but of proper amenities, such as a bed with pose balls labeled "Squirrel Her" and "Get Squirrelled." The artwork is tasteful and plentiful. Working elevator, clever curtains in the doors, and more, all yours for under L$600. And if you really like it, you can get one in your size for under L$3000 (not squirrel feed, but affordable). Yesterday I heard in the group chat that someone wanted Lucky Kitty Crew undies so I made a Christmas thong. 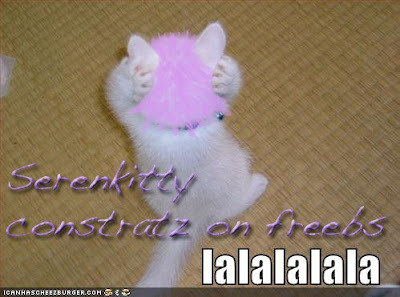 On the back it says Lucky Kitty and on the front it says Dis Ain't Free. You can get it on the left-side table at the HQ (SLurl). Look for the box in the picture here (the other has more freebs). And check out the other freebs around the tables. One of them on the back table is a Freebie Vendor with dozens of goodies inside: clothes, gadgets, building tools, textures, and more. Don't tell my wife, a custom and commercial skin maker in Second Life ®, but thanks to Vint Falken's blog (Web) I've learned of another source of free Photoshop® -format files that you can use to make free skins. Well, free plus the L$30 cost of uploads for a complete skin after you edit the template to your taste. For a really nominal cost you can have a skin unlike any other in-world. You can be YOU! 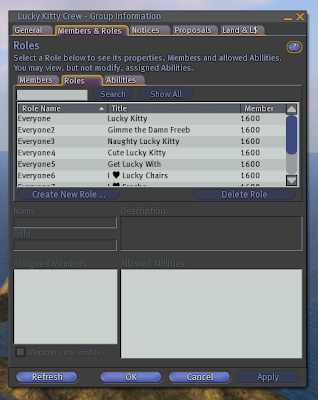 Look at that ... 1600 members when I peeked in to assign tag options at 10:00pm SLT. Sweet! Check this earlier post (Web) to see how you can have a different tag over your head when you hop chairs. Once again a Lucky Kitty (or someone close to a group member) has taken the low road to gripe about Serenity and the group in an obscure and anonymous forum rather than be grown up enough to stand by thier convictions. Fine. Freedom of speech can hurt, but try living without it. I may not agree with everything I hear in our group but I don't hide to stab others in the back. "Coward" I call you because a coward you are with your actions demonstrating your nature. Before I get off my soapbox (Web) I would like to call out the "non-callers." If you show to claim a chair please take a moment to announce the new letter to the group. Especially if the person who made the original group chat post isn't at the chair when you win. Many of us don't stalk a chair until we win, calling letters to the Crew so that the odds of "our" letter coming up increases. 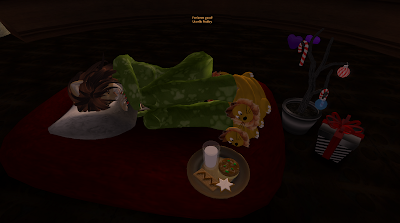 There are ten stockings hidden on The Isle of Lesbos (SLurl; Women Only) filled with gifts for the ladies. Another ten stockings are hidden on The Isle of Lesbos Mall sim (SLurl) with gifts that men and women would enjoy. No secret phrases this time around but the stockings may not be as obvious to find as in other hunts earlier in the year (Hints: I like to put them in amusing places and sometimes move them from day-to-day, but one is always near the main landing areas). Simply click the stocking and a folder full of goodies will show in your inventory with a name starting "Isle of Lesbos Stocking" followed by odd letters and numbers (I use them for sorting the stockings). There are no stockings hidden on Oasis of Lesbos or Bay of Lesbos sims but these places are great to visit if you have some time. Hopefully you've been looking for the wrapped presents that change content and location around the skating pond on the Isle (SLurl). If any male really wants the stuff for the ladies on this sim, please contact Uccello Poultry. I've been running around in this shirt from days. Serenity posted a notice about it awhile ago but it's so good I had to make sure it was shared!! Even my friend PlusMinus wanted in on the action. So who do you think looks better? 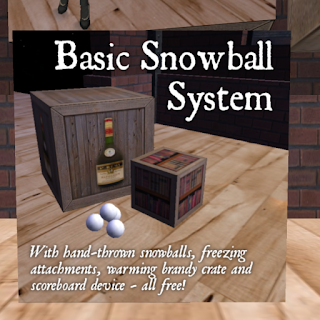 Ordinal Malaprop, proprietress of Ordinal Enterprises and creator of fine weapons and singular gadgets, offers without charge a Basic Snowball System at her shop in Caledon (SLurl). Much more than the standard snow ball throwers one can procure at other establishments, the System allows two or more persons to participate in a sophisticated game of Freeze Tag where each hit of a snowball causes the victim to become colder and colder until eventually succumbing to an utter and compleat freeze. The fine quality brandy provided in the kit effects relief whilst sophisticated score-keeping devices (astonishing in form and function, true examples that any sufficiently advanced technology is indistinguishable from magicks) ensure a fair and just playing field provided that either nobody cheats or everybody cheats. It is recommended that thrifty shoppers closely examine other articles displayed in the establishment as many are obtainable without fee or charge. Several such items have previously met recommendation in this blog but still more may be obtained by those diligent enough to search. Miss Malaprop writes a well-recieved Blog (Web) whilst her Flickr page (Web) features many of her creations. 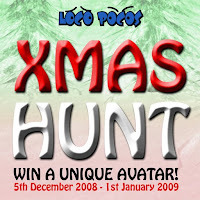 From the Loco Pocos Group Notices: The next long awaited hunt event has now arrived at Loco Pocos! Starting today, you have the chance to win a brand new UNIQUE event-only avatar that will never be sold. All you have to do to collect it is decorate your tree :) When you visit Loco Pocos Island, at the landing point you will find the XMAS dream teleporter, click that to enter the starting point for the hunt! Pick up your game HUD and find the first baubel located in that area. Find all 12 to win! See the Loco Pocos blog (Web) for details. I talked to Damien Fate today and he said the hunt won't be easy, but a special avie is a prize. ZOMG! Greenies now has Lucky Chairs (SLurl). 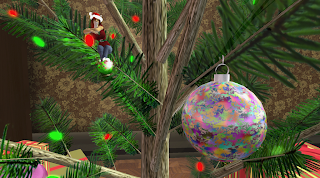 ZOMG Part II: Greenies is giving out Christmas Avatars! Your choice, tiny or regular but quantities are limited. By the time you read this they may all be gone. But go anyway for the Pirate Greenie Avies in the chairs (Left or East for men with a 20 minute cycle; Right or West for women with a 10 minute cycle). Also, if you join the Rezzable group they now have freebies for members. This time around it is a very green '70s Flair Pant Suit. BTW: Many thanks to Queen Coronet for for finding the free avies. Without you, Queen, I wouldn't have my cool Christmas avie or known about the Lucky Chairs. If you hadn't heard, there are two gift-wrapped presents on the Isle of Lesbos (SLurl; Women Only; men can contact Uccello Poultry after Christmas for the prizes) at the skating pond (use the teleporter at the entrance). The prizes and locations around the pond are changed every couple days. Look for the 2008 Isle of Lesbos Stocking Hunt to start very, very soon. 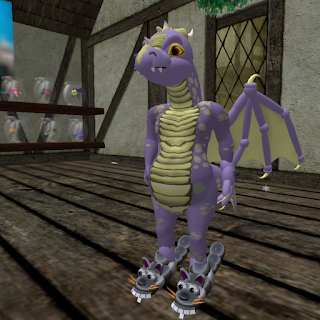 Wynx Whiplash has released new versions of her Tinies at Extrovirtual (SLurl). No word in the Wynxtastic group (Web) or other sources if older Tinies can be upgraded. Avie costs have remained at L$350 each. Now might be the time for me to replace the avies that were lost when my Inventory was trashed. Once again Solange is giving away some really smexy Christmas silks in red, white, and green (SLurl). Just buy each "ball" for L$0 to get yours. I'm not a big fan of the hats, but the silks are nice enough to wear year-round. Last year I used a freebie skin, wings, hair, and other bits to make a wonderful Snow Angel Elf avie with the white set of silks. Solange has two Lucky Chairs (SLurl & SLurl). One prize per chair and each is on a 30 minute cycle. The first chair currently has some nice red plaid silks. The second chair has an attractive green skirt outfit. 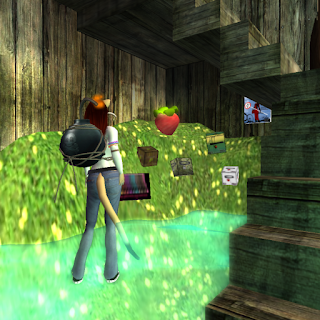 The same prizes can be found in an underground area in some "Grungie chairs" (SLurl). Another part of the underground area has merchandise at sale prices (and has a free T-shirt or tatt or something ... it's confusing; SLurl). I'm glad I explored the sim. It is gorgeously built and landscaped. More than worth a look even if you are not shopping or freebie hunting. I'm soooo jealous. I built something like this on spec for a client and it was never used. The "upstairs" Solange Sale area has Christmas outfits for L$300 each or L$1500 for a set of 8, either Santa's Saucy Elfs or Santa's Lil Hotties (SLurl). These look a lot like outfits from Lucky chairs in other stores but Solange quality is top-notch. Well worth a look if you still haven't found something that will turn his or her head. Way upstairs (use the teleporter) is the @Home Entertainment store. TVs and other "electronics" are available here, but I couldn't find the nice sports bras and shorts freebies that I got last year. Danged if I could find any information about a prize hunt, but if you do, please leave a comment on this post. Last year's prizes were incredible. One of my favorite seasonal freebies is the Mini Santa from XD Fusion but it is available on the Interwebs only (Xstreet SL Web; OnRez Web). It is stuffed with some gifts to give out but you can add to or replace those with gifts of your own. I have one hovering around me nearly all the time thru December as it is a great way to spread holiday cheer. 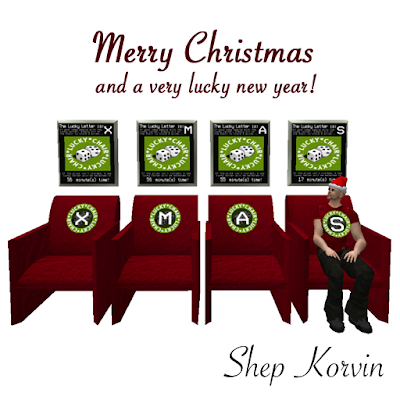 Use Xstreet SL (Web) or OnRez (Web) to snag more freebies or visit Todd Borst's store in-world (SLurl). Look inside the store for an animated skeleton, free if you tell it you found the shop thru our blog!